As consensus builds on player's drafting positions, it's smart to take note of the trends. Below are the five fastest ADP risers and why they are moving up the board. Jerick McKinnon's rise is a classic example of the is there no one else situation in what could prove to be a good offense in San Francisco. McKinnon has been a serviceable if unspectacular back in Minnesota, but with only Matt Breida to compete with for touches, McKinnon looks to be a surprising volume back in 2018. I'm always a bit wary of drafting backs strictly on their situation, and don't consider McKinnon a second round talent. I'd expect his ADP to taper a bit soon unless there is considerable good camp buzz. While all rookies tend to be ADP risers, Derrius Guice's rise has stood out as he's moved 3 rounds in a little over a month. Bad draft buzz and lower than expected draft capital tanked his initial value but positive camp reviews and the realization that he will likely win the first and second down duties in Washington. It's possible he will move even further than his current slot of 3.08 and crack the top 15 running backs. CJ Anderson is one of the highest risers rebounding all the way from the 13th round to solidly in the eighth. 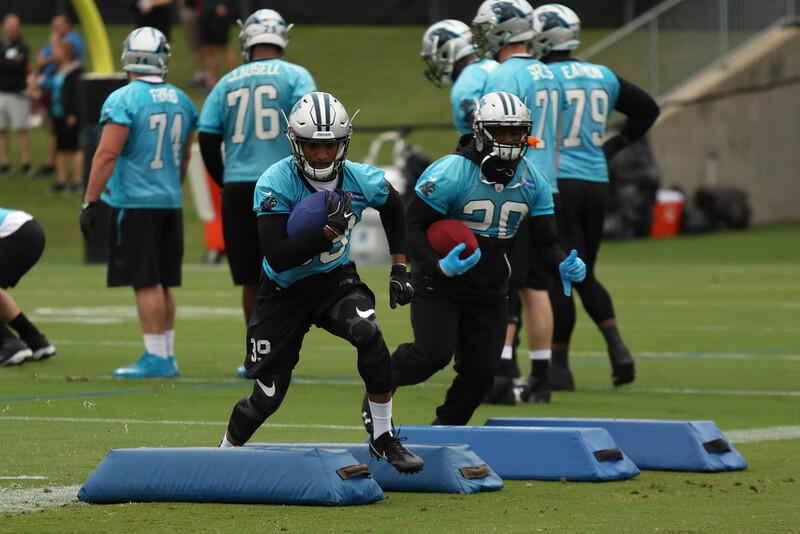 I think Anderson was a good fit for Carolina and question how often they are going to run Christian McCaffrey between the tackles leaving a decent chunk of touches on the table. If Carolina's offensive line is better, he could be a sneaky grab. DId you know Randall Cobb is only 27? Feels like he's 33. But it's put up or shut up time for Cobb in Green Bay and people seem to be buying in. Cobb has moved from the 10th to the 7th before tapering off into the eighth round. Jordy Nelson's departure opens up a whole lot of targets and if Cobb can stay healthy, I think he could have a nice season. You could do worse for a third receiver. Your fast riser at tight end is definitely Trey Burton, who has jumped almost 36 ADP places and now averages as the 9th tight end taken off the board in the seventh round. I'm not sold on taking him over a Jordan Reed or Tyler Eifert, despite their injury concerns, mainly because I have no idea how Mitchell Trubisky will do in that offense. But Burton is certainly built on what Mark Helfrich likes to run, so I see the upside.